Hello, friends I've been kind of quiet in here these days. That's because, like Santa, I've been busy in the workshop making handmade gifts for those on my Christmas List. I'll be sharing some of those projects in the coming weeks after the gifts have been opened. 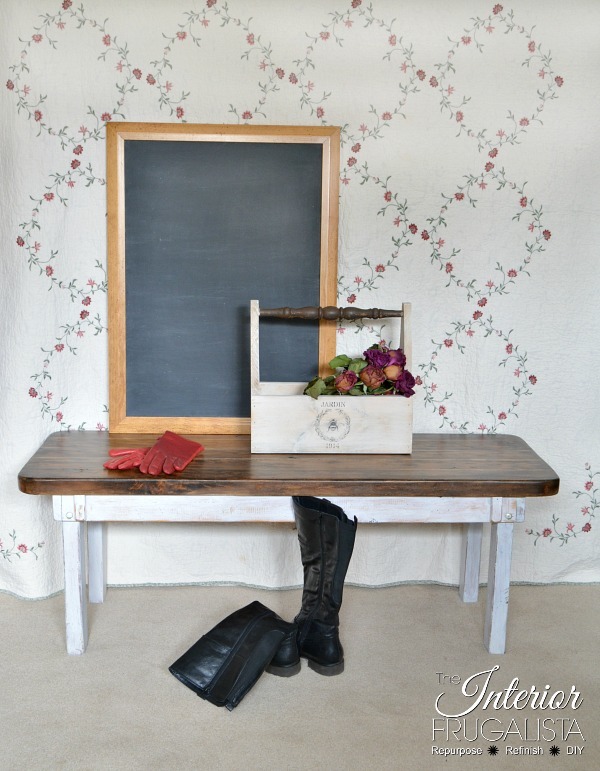 In the meantime, I'm sharing another bench makeover that I refinished for the holiday market. This one is far different from the Queen Anne style I shared last week. 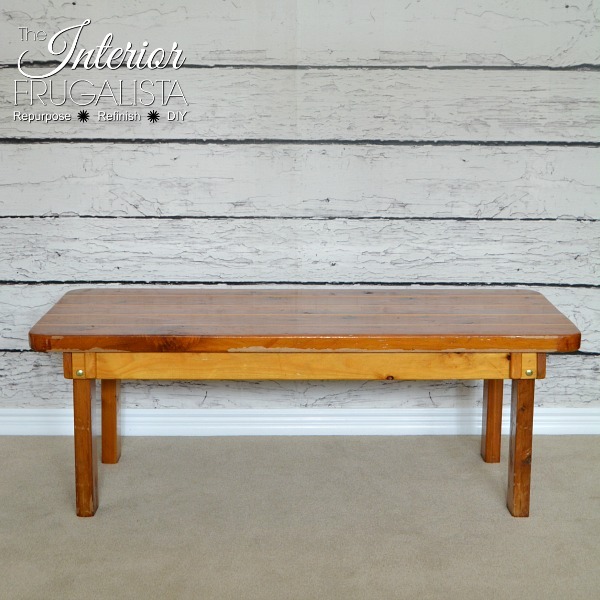 It is of solid wood construction with a fabulous wood slat top and judging by the layers of shellac, it may have been used outdoors or in a spa. 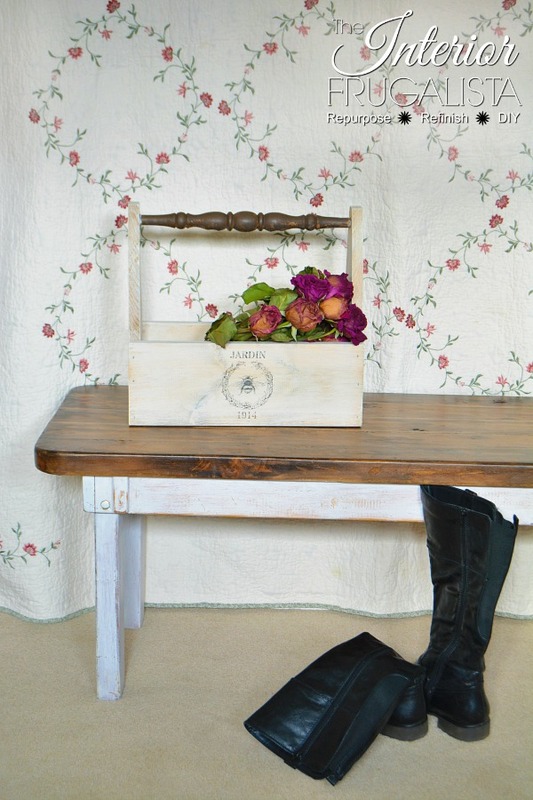 I saw it as the perfect bench to transform into a rustic Farmhouse Bench and so the makeover began. Like the Queen Anne bench, I could have sold this ten times over at the market. 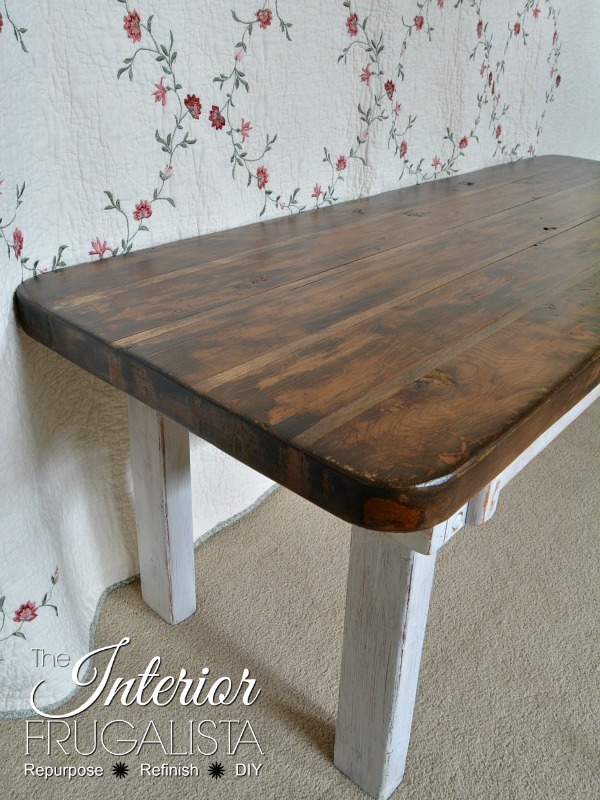 I'm thrilled that the couple who bought it said it was a perfect match to their new farmhouse style furniture and that it would be going at the foot of their new bed. I lost track of the number of hours spent removing the layers of peeling shellac. Judging by my aching right shoulder and sore feet, a lot. I painstakingly worked in small areas at a time removing the shellac with paint stripper, a putty knife, and orbital sander. Days were spent in the workshop getting it down to the raw wood but determination is my middle name and eventually we got there. 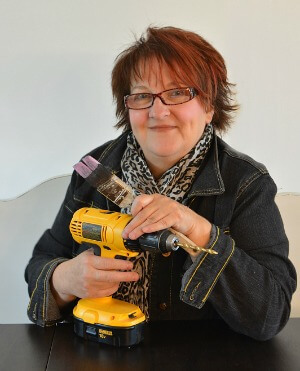 I have to thank Dixie Belle Paint Company for providing some of the products used for this makeover. 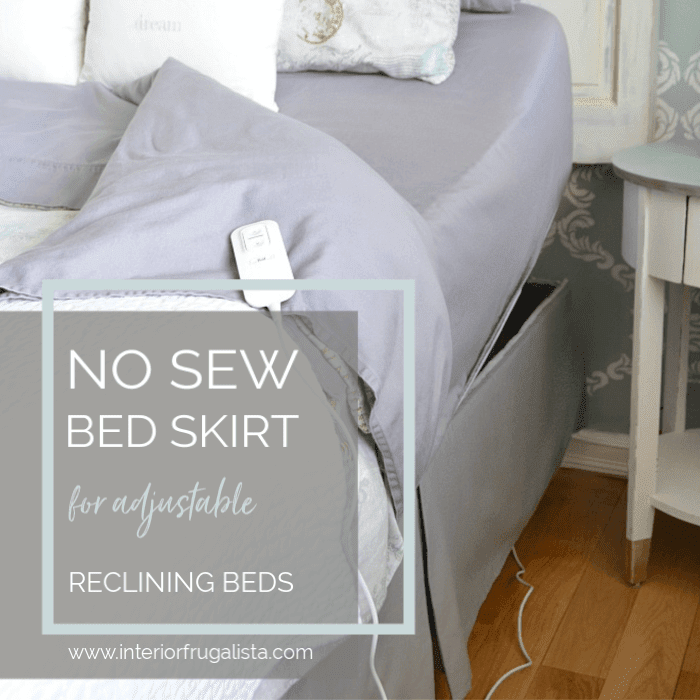 They were sent to use on my Vintage Waterfall Dresser and Antique Scalloped Tea Table makeovers but I had enough leftover to complete this project. 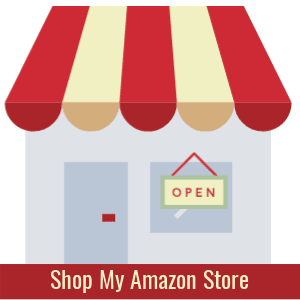 I've included affiliate links within this post for your convenience so you can see the products I used. See my full disclosure policy. 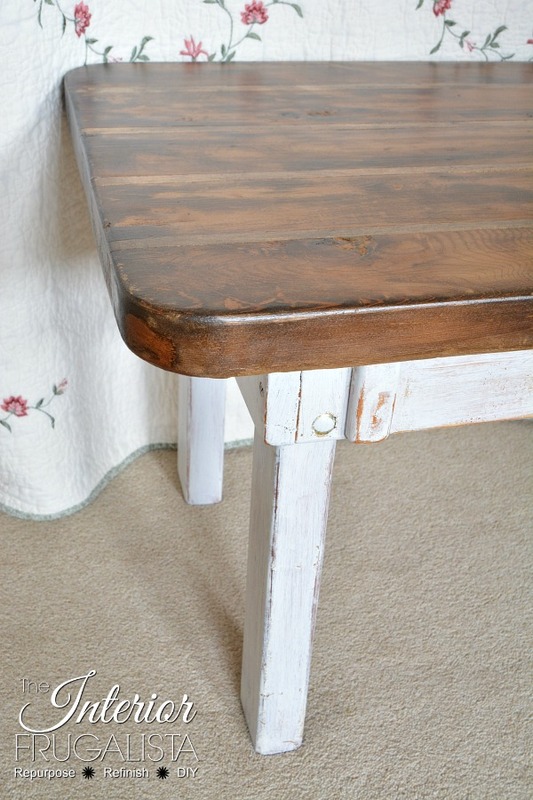 After successfully removing the layers of shellac with EZ Furniture Stripper, the first thing I did was dry brush a coat of Dixie Belle Paint in the color Fluff (white with gray undertones) over the base not being fussy about full coverage because I wanted a distressed look. Once it was dry (mere minutes) I ran a piece of sandpaper over the edges to reveal more of the natural wooden underneath. I used Dixie Belle Best Darn Wax to seal the paint. Then came that gorgeous wood slat top. 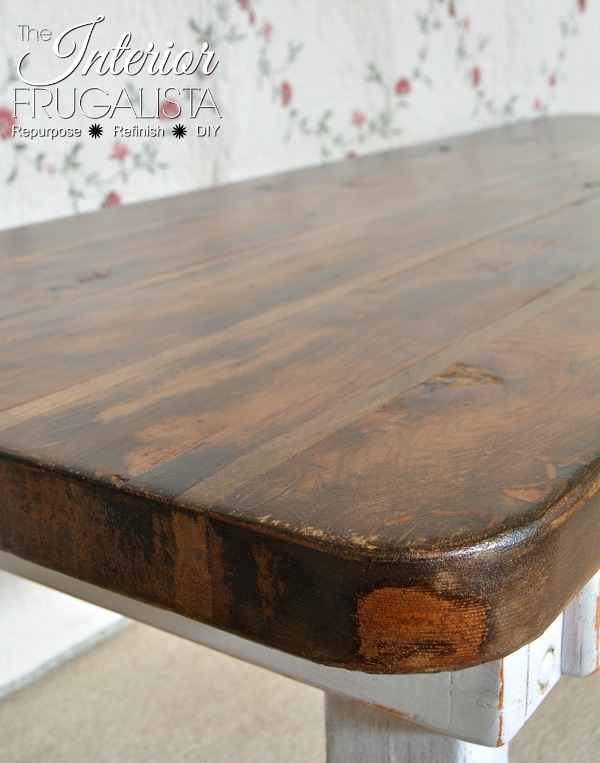 I didn't use a pre-stain wood conditioner first before applying the dark walnut stain because I wanted a rustic look that showed the imperfections left from the spots where I couldn't remove the shellac completely. One coat of dark walnut stain is all it took to bring out the small inlaid wood slats that I love about this top. I protected the stained finish with Dixie Belle Gator Hide (waterproof polycrylic). There is something about a white painted bench with a dark walnut top that makes my heart skip a beat. I think I did a happy dance across the workshop floor after this one. The wooden garden caddy on the bench was another DIY project where I repurposed an antique chair spindle for the handle. 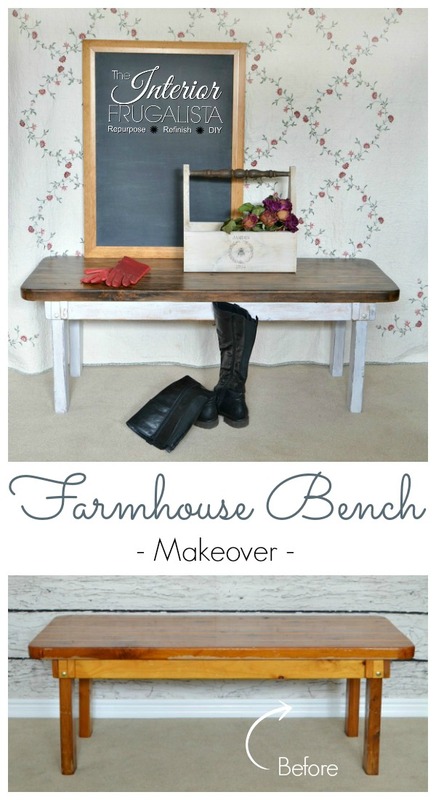 I am so thrilled with the transformation from Spa Bench to gorgeous Rustic Farmhouse Bench. If you like it too, please share it with a friend and/or save it on Pinterest. Next week I am sharing a special project that is very near and dear to my heart. Be sure to come back next Thursday to see that special gift.